Overview: Jacques Pot is a 5 reel, 20 payline, 10 coin Slot game. Jacques Pot has one wild icon and 1 scatter icon. The Mixer (Freespins) Icon is a Scatter Icon which triggers the Bonus Round Free Spin feature. If 3 or more these icons appear on the Reels you will receive 10 free spins. 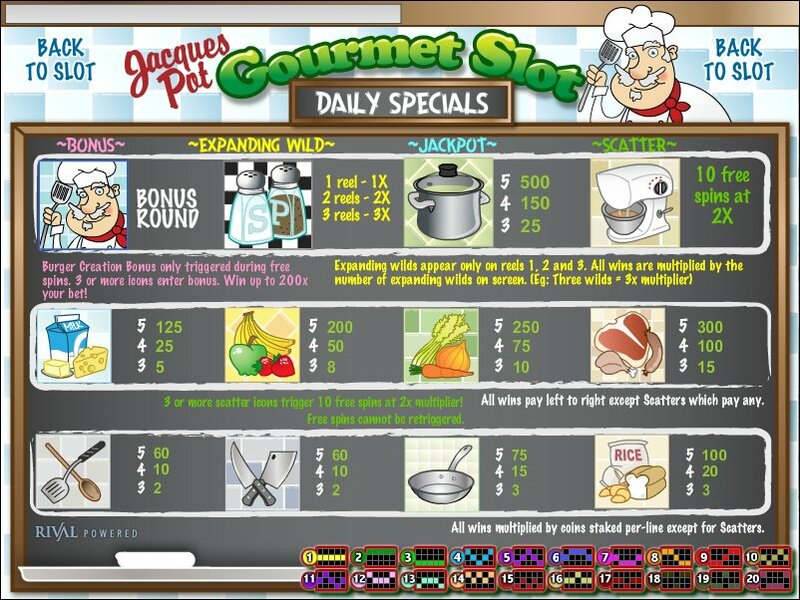 The Chef Jacques (Bonus) icons will become active for the duration of the free spins. Any wins received during these free spins will payout at 2X the payout listed on the paytable! 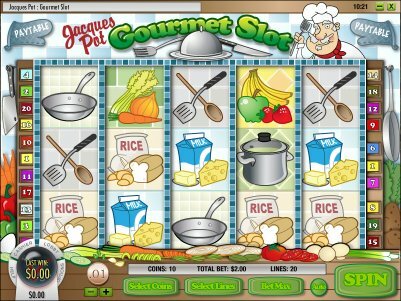 Jacques Pot - Gourmet Slot also has an expanding wild feature which is triggered when an Salt and Pepper icon can help complete a payline. This icon will substitute for any other symbol to form winning combinations, other than the Bonus Icon. When winning combinations of symbols could be formed, the Wild Salt and Pepper will expand to fill the entire reel, allowing all paylines to take advantage of the wild - this can allow for huge combinations of wins! Try to hit more than one wild at a time for even more chances to win! Similar Slots: If you like Jacques Pot, you might like these other Rival video slot machines: Blazin' Buffalo, Dog Pound, Goldenman, Ocean Treasure, Silver Unicorn, Travel Bug.